The study of weather patterns is intrinsically tied with that of the movement of wind and water. Shifts in the currents can have lasting yearly climatic consequences for many regions throughout the globe.But exactly how does the movement of water within the depths of the oceans affect the weather expressed on the surface? The weather itself is the product of the water cycle, the movement of water from one phase to another. Earth’s water is constantly recycled, evaporating with the heat of the sun and condensing back to the ground and the oceans. Water, in turn, is moved by its own currents, caused by differences in salinity and temperature: cold, salty water sinks, displacing warmer, less saline water. Currents can also be affected by underwater features such as trenches, basins, and seamounts, creating differences in its flow.In addition, the tides, winds, and the very rotation of the earth is known to affect the currents of the surface. The constant flow of both surface and deep-water currents plays a key role in evenly distributing heat throughout the planet, with the currents bringing warm water toward the poles and cooler water toward the equator. Bringing it full circle to the water cycle (and thus, the weather), the actions of the currents ultimately bring warmer water to the surface, creating more evaporation. The presence of warm water currents in warmer times of the year thus leads to more precipitation on land, and vice versa. This is amplified in the tropics: as more evaporation happens in tropical oceans, the surrounding regions are often very rainy. 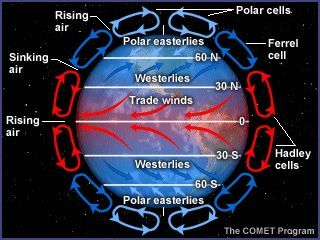 Outside the equator, the cycle of warm and cold currents is responsible for the frequency of precipitation at various times of the year. Jim Byrne is a weatherman who served as the chief meteorologist at KCOY CBS-12. Visit this blog for more updates on the fundamentals of weather. Next PostWhat are the methods employed in weather forecasting?